Archivist Peter Ryde reflects on our first 25 years. ‘You’ll never get anyone to fund a film archive,’ a wise but cynical veteran of the arts scene informed us. And it seemed he had a point. People were ready enough with words of encouragement, but the moment you held your hand out they turned their backs. Nevertheless, on the principle that it is better to light one candle than to curse the darkness, LFA started twenty-five years ago with no premises, no staff, no money, and just two films about life and work in Lincolnshire. Today we have over 700 titles, with a total running time of more than 120 hours, all stored in our temperature and humidity controlled vault for long-term preservation, with telecine video copies of every item available for viewing. Over the last quarter century, we’ve supplied material to countless TV programmes, released over twenty compilations on DVD, and put on around 300 archive film shows up and down the county. But now that we’re well established it’s easy to forget how very different everything was when we started. Back in 1986, the digital revolution was still in its infancy. Film itself was still being extensively used, and a few of the items now in the archive were actually shot after the LFA’s foundation. All our film shows were presented using 16mm film copies made from the originals, and when TV companies wanted to use our material, we had to send them the original film. Since they often needed it for transmission the same day, a despatch rider clad in extravagantly decorated leathers would come roaring up to the door astride an impressively powerful motorbike, and set the net curtains twitching all the way down the street. With no internet, contacts depended chiefly on our listings in the various trade directories; and PCs were scarcely more than the latest plaything in our early days. It was still the pre-wysiwyg era of daisywheel printers and software so primitive that it was more of a hindrance than a help. So the details of each film had to be laboriously recorded on old-fashioned index cards, and when it came to producing publicity material there was nothing available between photocopied typescript and costly commercial printing. Towards the end of the 20th century there was an awkward time when film facilities were vanishing faster than their electronic replacements were being developed. One after another, the old film laboratories closed down, and getting showprints made became almost impossible. Yet high quality video projection remained technically difficult and prohibitively expensive. In any case, video picture quality was still very limited, and video editing was a nerve-racking business requiring meticulous advance planning, since mistakes were almost impossible to rectify afterwards. But fortunately, the last ten years have seen major advances in digital image technology which more than compensate for the loss of the older, traditional methods. In many ways it is actually easier now to bring archive motion picture back to the screen than it was when film itself was the only viable medium. Rather than struggling to avert what was proving to be a terminal decline, we have now moved into a period when for the archivist and film restorer the new possibilities seem almost unlimited. So as we prepare to enter our second quarter century, the prospects look enouragingly bright. 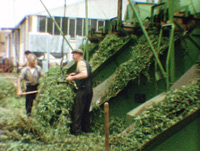 Brief items accessioned recently include a fire at Lincoln, a clay pigeon shoot at Gedney Drove End, and some fascinating footage of pea vining at Holbeach Hurn in the early 1960s. Amongst the more substantial items is another film about the building of the Humber Bridge. With a running time of 72 minutes this is quite a blockbuster, but what makes it especially welcome is that it neatly supplements our previous footage rather than simply duplicating it. 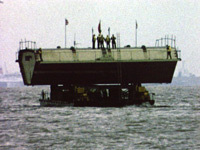 It includes some excellent material showing the spinning of the huge suspension cables, and manoeuvring the deck sections into position. There are also some amazing views from the top of the south tower, and good coverage of the opening ceremony. Somewhat shorter, at a mere 27 minutes, is a film about the 1984 Cleethorpes geothermal project. With equipment resembling an oil rig, a bore more than a mile deep was excavated in the hope of finding a source of natural hot water that would solve the town’s energy problems. In the event, the water wasn’t hot enough to be any use. Shame about that. Nice film, though, and pretty unusual subject matter, so we’re delighted to have it. In April we took part in a Heritage Day at Grimsby, organised by the Society for Lincolnshire History & Archaeology. 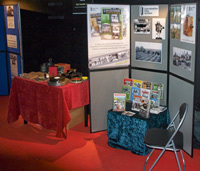 Then in September, we had a stand at the BBC Reel History of Britain Experience, again at Grimsby. 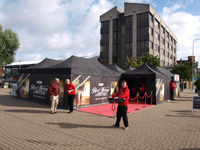 Some short archive programmes specially commissioned from us by the BBC were shown in the main auditorium throughout the two-day event and at various additional venues the following week. Together with several other recent film shows in the region, these heritage presentations have given us a welcome opportunity to make our mark in the Grimsby area, not always easy since we’re based in the southernmost part of the county. Though the stream of visitors was virtually non-stop, our Treasurer Jeremy Satherley found time to take these pictures of the event at Grimsby. 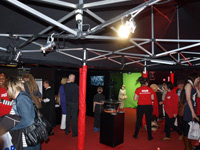 Top attraction was the ‘Green Screen’ stand where visitors could dress in period costume and see themselves appear seamlessly merged with archive film of a typical Edwardian street scene. Francis Dyson, a Ph D candidate at the University of East Anglia, is researching pre-WW2 Amateur Film Societies, and has very kindly passed on to us some further information about the Lincoln Amateur Film Society, whose production ‘Circumstantial Evidence’ is featured as the Bonus in Part Two of LFA’s new series ‘A Century on Film’. From copies of early amateur cine magazines, Francis has discovered that the society was formed in 1932, not 1933 as we had thought, and that ‘Circumstantial Evidence’ was not its only production. Another, a comedy called ‘Parish Haul’ had already been completed and shown, and work on a third film ‘Special Edition’ had been suspended because of an injury to one of the cast. It seems it was still unfinished when the society closed down. Besides contemporary reviews of the two completed films, Francis has also unearthed some details about the society’s various committee members. His work is still in progress and we look forward to reading the final thesis. In the meantime we thank him for sharing his knowledge with us, and wish him every success with his further research. Following its launch in 2010, LFA’s major new project is progressing well. Volume 2, covering the 1930s was released on DVD in the Spring. The third part, a revised and updated version of our earlier DVD The Home Front covering the war years, is also now available. You’ll find news of subsequent volumes on our website as they appear, you can phone 01205 750055 for the latest details or the item can be purchased online from Primetime Video's website.